Archibald Fenner Brockway (1888-1988), Baron Brockway from 1964, was a politician and campaigner. He wrote just one science fiction novel: Purple Plague: A Tale of Love and Revolution (1935), in which a passenger liner is quarantined for a decade because of a plague. A new egalitarian society emerged; there is much opportunity for satire. Later in life, dissatisfied with the original, he rewrote it as a television play: Red Liner: A Novel in TV Form (1962). For more detail, see the Encyclopedia of Science Fiction. Fenner Brockway was born in Calcutta, the eldest of the three children of a London Missionary Society missionary: his grandparents, parents, uncle, aunt and sister were all missionaries, in Madagascar, China and India. At the age of four he was sent off to live with his maternal grandparents: his grandfather was estate manager for Lord Burton, the head of Bass breweries. His mother died when he was fourteen. He was educated in Blackheath, at the School for the Sons of Missionaries, from the age of eight until he was sixteen. He was rebellious (the shape of things to come? ), and frequently beaten. About two years before he left school, he started a weekly magazine; naturally, when he left he became a journalist. He became interested in politics at the time of the Boer War, but the inspirational moment was hearing George Bernard Shaw speak. In 1912 (having moved from the Liberal Party to the Independent Labour Party), he became editor of the ILP newspaper, the Labour Leader. His heroic war experiences gave him considerable status among the Left. The war led him from pacifism into anti-imperialism. He became editor of India in 1919, and joint secretary of the British committee of the Indian National Congress. He became editor of the New Leader, the new name for the ILP newspaper, and moved to the left with the ILP. He was selected as a Labour MP for East Leyton in 1929 (his brother-in-law became MP for West Leyton), and thought that the number of his voters might be providential (11,111: won, won, won, won, won). But he was too rebellious to be endorsed by the Party for the 1931 election. He did not only have trouble with his own party colleagues: he got suspended by the Speaker for a while, because he ignored House protocols by interrupting to insist on a debate about the imprisonment of dissidents in India. He waved around a Gandhi cap, and, taunted by Tories, put it on: a gesture remembered for a long time in India. a stupid and disastrous error, and, appointed Chairman at Easter, I was largely responsible. It was stupid because we departed just when the party was turning Left […] It was disastrous because, outside the Labour movement, the ILP dwindled to relative insignificance and because the Labour Psrty lost the inspiration of the Socialist evangelism and dynamism which the ILP at its best contributed. My support of disaffiliation was the greatest political mistake of my life. All I can say is that I did my damnedest to reach a settlement (107). Brockway often found himself squeezed between two opposites. In the Spanish Civil War he hated the Francoists, but distrusted the Communists: indeed, he was “utterly disillusioned with Communism under Stalin” (128). The Spanish Civil War did cause him to rethink his pacifism: “I appreciate the attitude of the pacifists in Spain who, whilst wishing the workers success, feel that they must express their support in constructive social service alone. My difficulty about that attitude is that if anyone wishes the workers to be triumphant he cannot, in my view, refrain from doing whatever is necessary to enable that triumph to take place” (quoted in the Wikipedia article on Brockway). He wrote a letter to the ILP representatives in Barcelona on behalf of Eric Blair, and afterwards helped to get Blair’s Homage to Catalonia published (under the pseudonym of George Orwell). In the Second World War, he hated the Nazis, but also disliked British militarism. He supported Britan’s involvement, but acted as Chair of the Central Board for Conscientious Objectors throughout the war (and continued to serve as Chair until his death). After Labour’s victory in 1945, he rejoined the Labour Party; he noted that the ILP had totally lost contact with people, since its leaders had put forward very few candidates, thinking that Churchill was going to win. In 1950 he became the Labour MP for Eton and Slough (he had been selected as Labour candidate over Roy Jenkins). He enjoyed being MP for two such disparate groups, and claimed in his memoirs that he once persuaded a third of the schoolboys in the Eton College political society to vote for socialism. With some misgivings, he accepted a life peerage in that year, as Baron Brockway of Eton and Slough, and became probably the most radical member of the House of Lords. I said to the House that I was far to the Left of Communists. They wanted one revolution: I wanted two—social revolution in the West, a libertarian revolution in the East (243). His wife—he had divorced in 1945, and remarried—refused to call herself Lady Brockway: “anti-Establishment and egalitarian to her finger-tips” (235), but he rather enjoyed the new life. During his life he wrote over twenty books on politics, as well as his science fiction novel. 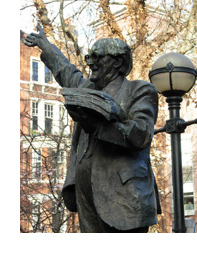 A statue commemorating him in Red Lion Square was proposed in his own lifetime: see at the top of this page. David Howell’s piece in the Oxford Dictionary of National Biography ends with these words: “Born in the age of Gladstone, he died in the age of Thatcher on 28 April 1988, at Watford General Hospital, Hertfordshire”. The information comes largely from the piece in the ODNB mentioned above, supplemented by quotations and information from Towards Tomorrow: The Autobiography of Fenner Brockway (London: Hart-Davis, MacGibbon, 1977).